NOTE 1: In bolted beam-to-column joints or beam splices it may be assumed that prying forces will develop. NOTE 2: In method 2, the force applied to the T-stub flange by a bolt is assumed to be uniformly distributed under the washer, the bolt head or the nut, as appropriate, see figure, instead of concentrated at the centre-line of the bolt. This assumption leads to a higher value for mode 1, but leaves the values for FT1-2Rd and modes 2 and 3 unchanged. (1) Although in an actual T-stub flange the forces at each bolt-row are generally equal, when an equivalent T-stub flange is used to model a basic component listed in 6.2.4.1(1), allowance should be made for the different in forces at each bolt-row. (2) When using the equivalent T-stub approach to model a group of bolt rows it may be necessary to divide the group in to separate bolt-rows and use an equivalent T-stub to model each separate bolt-row. b) the total force on each group of bolt-rows, comprising two or more adjacent bolt-rows within the same bolt-group, should not exceed the design resistance of that group of bolt-rows. b) the contribution of each bolt-row to the maximum design resistance of two or more adjacent bolt-rows within a bolt-group, determined considering only those bolt-rows. (5) In the case of an individual bolt-row X-Eeff should be taken as equal to the effective length £eff tabulated in 6.2.6 for that bolt-row taken as an individual bolt-row. (6) In the case of a group of bolt-rows X£eff should be taken as the sum of the effective lengths £eff tabulated in 6.2.6 for each relevant bolt-row taken as part of a bolt-group. (1) Backing plates may be used to reinforce a column flange in bending as indicated in Figure 6.3. (2) Each backing plate should extend at least to the edge of the column flange, and to within 3 mm of the toe of the root radius or of the weld. (3) The backing plate should extend beyond the furthermost bolt rows active in tension as defined in Figure 6.3. 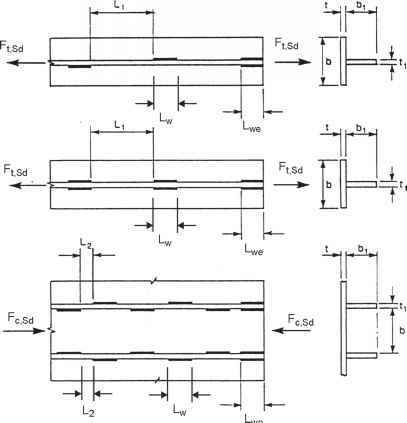 (4) Where backing plates are used, the design resistance of the T-stub -FT,Rd should be determined using the method given in Table 6.2.